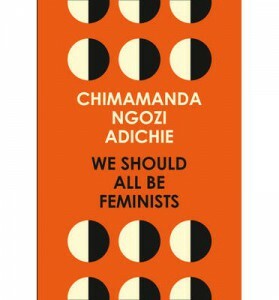 Recently, Fourth Estate released We Should All Be Feminists, an essay by Chimimanda Ngozi Adichie, author of Americanah. The piece is based on on her 2012 TEDxEuston talk of the same name (see below). It’s a slim volume – about 50 pages on paper – more like a Kindle Single than a standalone book. In it, as she did in her TEDx talk, Adichie advocates for feminism through a series of anecdotes. In essence it is a piece that outlines her journey into feminism; but above and beyond that, she provides instructive arguments for calling upon equality through feminism. We Should All Be Feminists is something of a primer. She relates her own experience growing up in Nigeria, imparting a number of life moments where she has reproached for acting outside of societal gender norms, or has been advised against describing herself as a feminist. “We have evolved. But our ideas of gender have not evolved very much.” One thing is clear: this is an author who grew up in a place where feminism is a derided term. She speaks to meet that audience and bring them to her side. Adichie’s arguments are a series of brief examples of inequality in action peppered with calls to arms. She believes that “Gender as it functions today is a grave injustice”. She speaks of men’s fragile egos and women’s training to cater to them. To make a change, she says, we must raise both boys and girls differently. One of the most compelling arguments for me was elucidated in an example of her being told to make her brother an omelette when he was hungry. What a crucial thing it is, to nourish oneself, and to nourish others – yet, in many cases, we don’t value teaching men to fend for themselves in this way. She loops this into the point that men are taken seriously by default, while women must earn that respect. Her perceptive reasoning gives these points gravity without preaching. As a TEDx talk, you could read this in about 20 minutes or so. If you’re new to feminism, or are looking for new ways to reason your arguments, this is definitely a good place to start. To support The Essayist Project, please consider purchasing We Should All Be Feminists using these links: Amazon | Kindle | Book Depository.